The Jordan Valley Medical Center released the results of its investigation into the missing body of Jacob Stevens, claiming that it had been sent by mistake to the University of Utah Medical School to be used as a cadaver. Attempts at locating the body have been unsuccessful. Jacob’s parents are pursuing legal action against both entities. The investigation is complicated by the fact that the security footage of the morgue was not functioning for most of the evening. The video was working fine when the deceased’s body was delivered to the morgue but the camera but stopped working a few minutes later. The failure was not discovered until the next day. Valerie Ellis, a spokeswoman for the University of Utah, reported that each cadaver delivered for the new semester has been identified. Unfortunately, Jacob’s corpse is not among them. The Jordan valley Medical Center declined to comment. However, a source who asked to remain anonymous indicated that a the police are investigated the possibility that the Jacob’s body was stolen by his killer to prevent further investigation into the shooting. The West Jordan police department denied any knowledge of such an investigation. 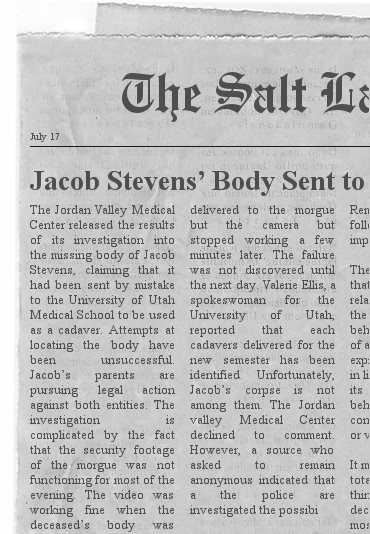 Leave a reply on "Jacob Stevens Body Sent to U of U"